The Haley's Corker is an ingenious bottle pourer and stopper, which aerates your wine as you pour, drip-free, so there's no need to use a decanter or other method to allow your wine to breathe. 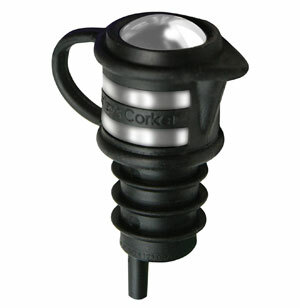 Perfect for corked wines, champagne, beer, liqueurs, vinegar, olive oil and more. It is a smart and simply brilliant little gadget, reasonably priced that works fantastically. It is not only perfect for any kitchen but also picnicking, boating, camping, etc. ; it allows you to transport open bottles without spilling a drop! This creative tool is ideal for catering, bars, and restaurants, where busy staff repeatedly opens and reseals wines and liqueurs.